Made with flavors and ingredients similar to a chicken salad or a tuna salad, this chickpea salad is made with chickpeas, mayonnaise, mustard, celery and sweet pickle relish. You could add in a little fresh dill if you happen to have some on hand as well, and, depending on personal preference, you might want to add in some diced onion or even some chopped green onion. 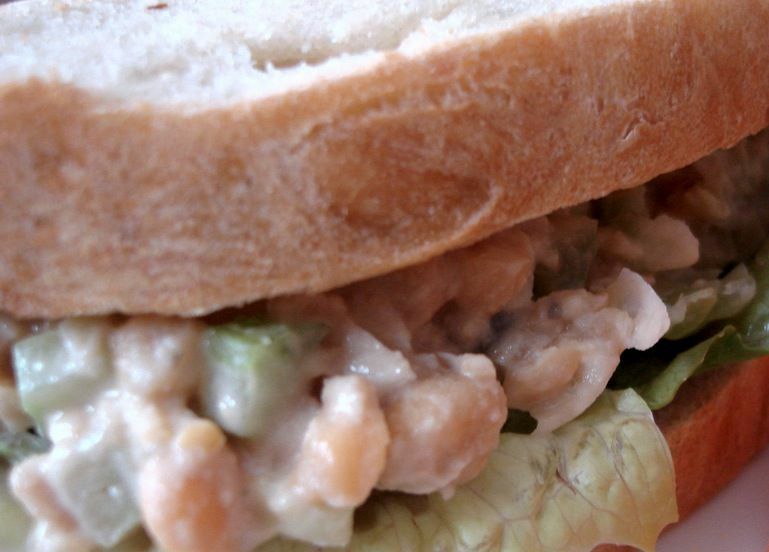 Chickpeas make a great meat substitute in this sandwhich! If you just make chickpea salad (and not sandwiches with bread), all the ingredients are gluten-free, though you might want to check the mayonnaise, mustard and relish of any additives. Need it to be vegan? Just use an egg-free vegan mayonnaise (my favorite brand is Vegenaise) in place of regular mayonnaise, since all of the other ingredients are egg-free, dairy-free and vegan. First, if you're using fresh cooked chickpeas, plan on about 1 2/3 cup, cooked, and, I recommend cooking them a little extra longer than usual so that they are extra soft and easy to mash. Mash together the prepared chickpeas with the mayonnaise, mustard and the lemon juice until the chickpeas are mostly smooth but still slightly chunky for a nice texture. Add the sweet pickle relish, minced celery, and a bit of salt and pepper. You can stop here, and plate your chickpea salad on lettuce and serve just like that, or, you can make sandwiches. To make sandwiches, first, lightly toast slices of bread and place a thin layer of lettuce on the bread, then top with tomato slices and a scoop of the prepared chickpea salad mixture.